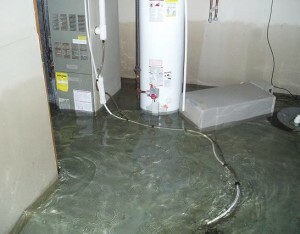 Water damage restoration is an emergency business. That’s why ServiceMaster DAK is on call 24 hours a day, 7 days a week, and 365 days a year. Our quick response will reduce your suffering and save you money. Water damage to structure and personal belongings increases substantially if not addressed promptly. Whether it’s a failed sump pump, sewer back-up, hot water heater break, or weather related frozen and now burst pipe ServiceMaster DAK has IICRC certified water technicians to address the mess at your home or business. In flooding, water typically spreads and flows through the path of least resistance, running through floors, between walls and ceilings, gravitating down to lowest levels. Porous materials such as wood, drywall, insulation, carpet and other building materials will soak up the water which will then wick upward not unlike the edge of a paper towel in a drop of water. The resulting effects can include discoloration, swelling, broken adhesive bonds, delamination (flooring separation), and with no water restoration services, mold. The more time that elapses without proper water damage cleanup, the more severe the damage. Damage from water and bacteria growth can begin within hours. Initial Inspection and assessment: Our trained, water certified technicians perform a walkthrough of your property in order to assess where the water has traveled. We’ll use state of the art non-invasive meters to determine what’s wet. Our technicians will document the water damage at your property by digitally photographing everything. We’ll save any broken part we find for you or your insurance company. We’ll determine the type of water that caused the damage. Was it: Clean water (water from a clean source with no debris), Grey water (water that is not necessarily clean but not hazardous, washing machine, dishwasher overflow etc.) or was it Black water (sewage back up), or was the water temperature hot, from a water heater, affecting the glue used to hold carpet fiber together. 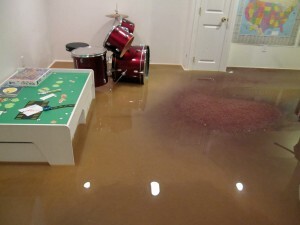 The type of water damage will affect the restoration process. Just because materials appear to be dry, doesn’t mean they aren’t hiding moisture. Water removal and necessary demolition: Technicians will extract all standing water from wet carpet, tile and other flooring along with water trapped under cabinets and hidden in other areas. Our goal is to save and dry as much material as possible. Extraction removes water 1200 times faster than dehumidification. A typical truck-mounted extractor will pull about 25 gallons of water a minute, while your best dehumidifier will pull about 30 gallons a day. That’s a huge difference. For every drop of water you leave behind during extraction it will take you 1200 times longer to dry the material using dehumidification alone. Some materials must be removed in order to dry more important items like salvageable carpet, wall studs, sub floor and other framing structures. Typically wet carpet padding and baseboard is removed and sometimes the lower portion of the drywall or paneled walls in order to carry dry air into a wall cavity. Cabinet toe kick may be removed in order to get air movement under a cabinet and at the wall it’s attached to. Installation of drying equipment: Air movers are strategically placed to evaporate moisture. Dehumidifiers are installed to remove moisture from the air. The drying process and proper placement of equipment is critical in restoring your home to pre damaged condition and preventing mold/fungal contamination. Drying equipment is typically on site for two to three days. Monitoring of drying equipment: ServiceMaster DAK technicians will stop by your property daily to ensure everything is drying as quickly and efficiently as possible. Moisture and humidity readings are taken daily, required by most insurance companies, and equipment is removed and rearranged as needed. ServiceMaster DAK certified water technicians are trained in psychometrics, the science of drying. Our technicians will take baseline readings referred to as “dry standard” of the non affected structure and air in your property. Once the affected area structure measures moisture at or below “dry standard” we’ll remove our equipment. ServiceMaster DAK works with most insurance companies and will handle your water damage remediation claim quickly and efficiently. Try to determine where the water is coming from and secure the break. If you can’t, shut off your water at the main water supply valve. This is usually located near the street. Remove as much water as possible by mopping, shop vacuuming and blotting. Wipe furniture dry, lift draperies off of the carpet (loop through a coat hanger and place the hanger on the rod). Place wood blocks or aluminum foil under the legs of furniture. Remove wet area rugs or other moveable floor coverings. Remove photos, paintings, art objects and other valuables to a safe dry area. Wet books and papers should be spread out to dry in a safe dry area. If damage occurs in a cool season make sure the heat remains on. If it’s hot run air conditioning this will draw out moisture. Take photos of everything you must throw away for your insurance company. DO NOT use an ordinary household vacuum to remove water! DO NOT lift tacked down carpet without professional help. This may spoil the carpet. Serving Northbrook IL 60062, Wilmette IL 60091, Glenview IL 60025, Highland Park IL 60035, Lake Forest IL 60045, Winnetka IL 60093, Buffalo Grove IL 60089 and surrounding areas since 1975.